We often head over to Bend in October when the canals are shut off and the river above and just below Bend begins to rise. 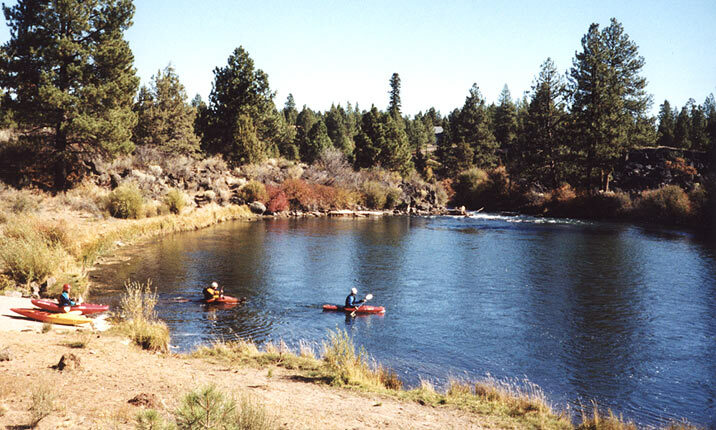 This is kind of a ritual for our group as the Upper Deschutes almost always has water this time of year. 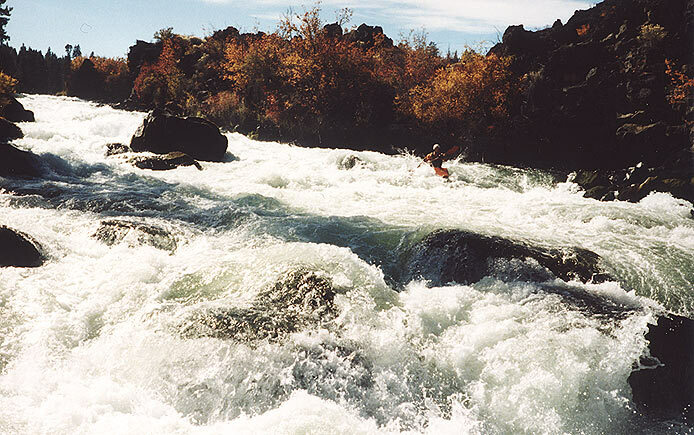 The Fall is typically the lowest point of the year for most Northwest rivers, so it is always nice to paddle some rapids with water in them for a change. 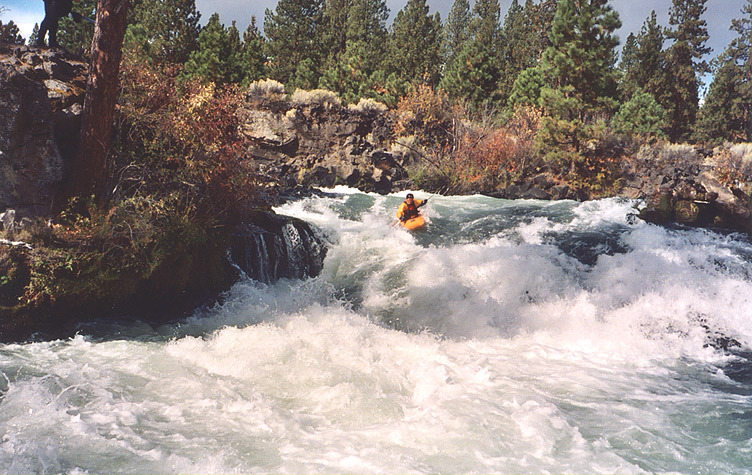 The flows on the Deschutes are usually predictable in the fall, but this year was the exception. Due to the all-time record low rainfall, the area farmers ended up keeping the irrigation canals open longer than usual. 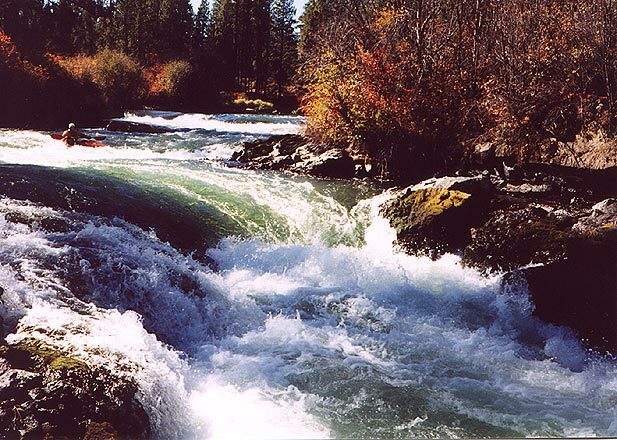 We were lucky to have a nearly optimal first time flow of 900 cfs on Pat Welch's Deschutes above Benham gauge for this trip, but by the next weekend the levels had dropped to nearly half that amount. It is unfortunate that this is the case, as the river would have plenty of water to kayak year-round if it were left unmolested. 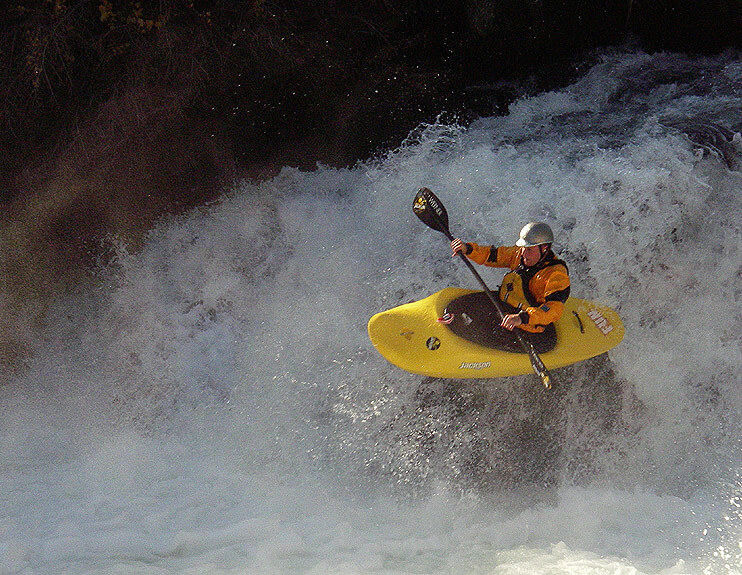 Jesse Coombs runs Dillon Falls. Pete 'warms up' in the hole below Dillon Falls. After awhile Pete flushed out upside down and it was my turn. I had a bit more speed than Pete and was able to keep my bow down; I subbed out nicely and surfaced upside down in the backwash and rolled up just in time to hit the first rapid in the gorge below. It was a nice way to start the day! Pete enters the gorge below Dillon Falls. The Gorge below the falls is waaay too short, ending in what is essentially a lake above the Big Eddy section. 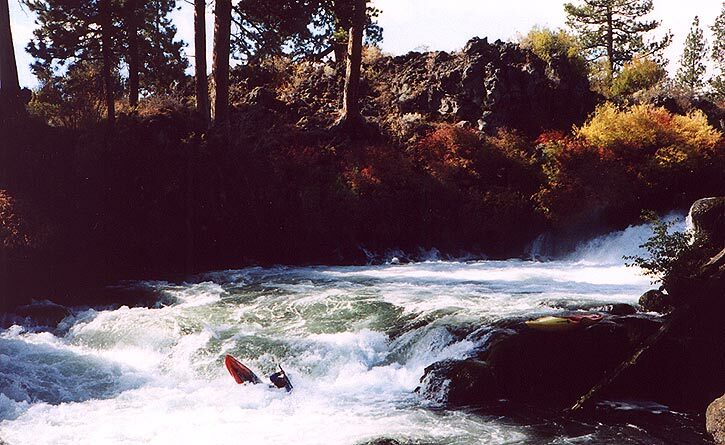 Once past Big Eddy (which was scenic but mind-numbingly boring) we ran the Lava Island Falls section again. What follows is the report from our run down that section the day before, when we had a larger group. On Saturday Mike Haley, Tom Powers, and Steve Stuckmeyer drove over from Eugene while Pete Giordano and I headed down from Portland. 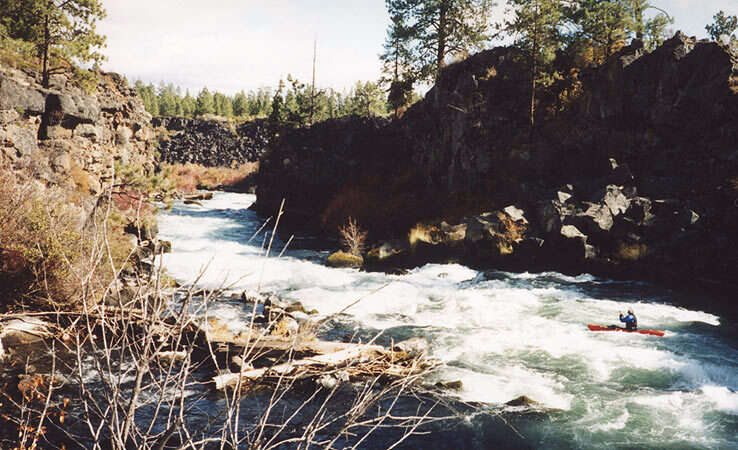 We met up at Alder Creek in Bend and then headed upstream to run the Lava Island Falls section. 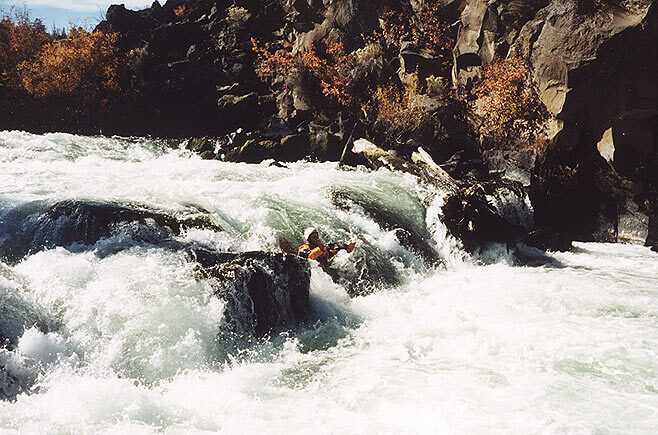 None of us had ever done it before, so we were all pretty psyched to see some new whitewater. The put-in is a large pool just above the falls, so we paddled over to the river right side and got out to scout. The falls has two parts: The top is a swirly lead-in to a narrow drop into a hole, followed by a pushy runout to the main ledge-drop. Pete, Steve, and Mike at the put-in for the Lava Island Falls run. Lava Island Falls starts immediately downstream from this pool..
Steve Stuckmeyer lines up on the top drop on Lava Island Falls. Just below the top drop on Lava Island the current crashes into some logs piled up onto a rocky island that divides the current. 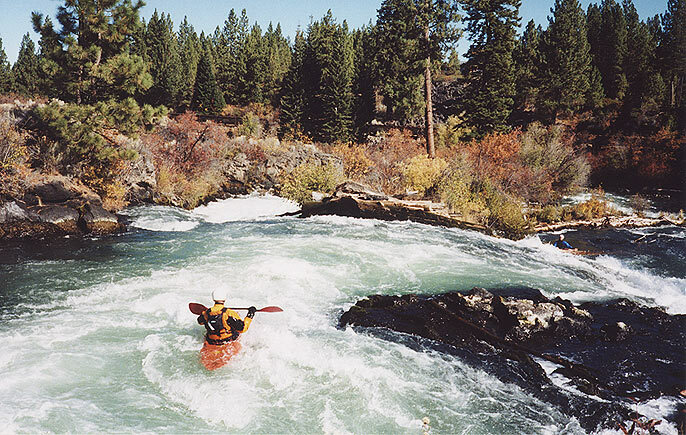 The left side drops into a narrow, aerated hole that according to a local paddler has separated many good boaters from their gear, and the right slides into a river-wide hole with a long runout below. Steve Stuckmeyer just below the first drop, with the island dividing the current straight ahead. The left side is obviously where the bad hole is, and on the right is the sloping ledge-drop that we ran. If you look closely you can see Pete downstream in the eddy next to the island. On the second ledge-drop most of us opted for the far right side, going with the flow down through the gut of the hole, doing a meltdown into the foam and surfacing downstream in the outflow. Jon Fowlkes rounds the corner and turns on the afterburner as he approaches the lower drop on Lava Island Falls. Below Lava Island the river immediately drops into a nice splashy drop known locally as 'Cut Up'. At this flow all of the rocks were covered, but at lower flows there are some sharp rocks here according to the guidebooks. After a few smaller drops we arrived at a pool and saw a horizon line dropping into a steep gorge below. The gradient appeared to be quite impressive in this section, so we got out to scout at the top. This rapid is known as 'Barry's Back Ender' and is probably the most intimidating drop on this section at this flow. As we scrambled along the trail on the right bank we took note of several nasty pin rocks in the main flow, a log on the right side, and a log choked sieve on the bottom right known as 'Loren's Lunch Spot'. The entire rapid from top to bottom was about a hundred yards long, with the real meat of it coming at the end with the wood and a large hole on the left. Downstream from this last part the river was non-stop white as far as the eye could see, with a river-wide log about a hundred yards downstream from Loren's Lunch Spot and more logs in the current below that. This rapid reminded me a lot of the Zig-Zag canyon section on the Green Truss at three feet or higher; it had the same consequential feel and pushiness. After a short discussion a couple of us climbed out on top of Lorens in case somebody swam and got stuffed under the wood while Steve hiked back up and got ready to probe. Steve ran down the left side and had no problems, charging right down into the gut of the sticky ledge hole at the bottom. He was under water for a second or two and the then shot up downstream in a big stern squirt! He eddied out while I hiked up to run the drop. I had no problems, starting left and then working my way out to the middle at the bottom. It was fun! Steve, almost at the bottom of Barry's. I was standing on top of the woody sieve known as 'Loren's Lunch Spot' when I took this photo. Note the large boulder in the middle of the river that divides the flow. The right side has an ancient log jammed in it, forcing a run down the left. Steve going for the meltdown into the bottom hole at Barry's.. Once again, this photo was shot from the top of the log sieve known as 'Loren's Lunch Spot' on the right side of the river. Pete, waiting with a rope on top of Loren's Lunch Spot. Below Barry's the river careens in and around some logs, including a river-wide log a hundred yards downstream. 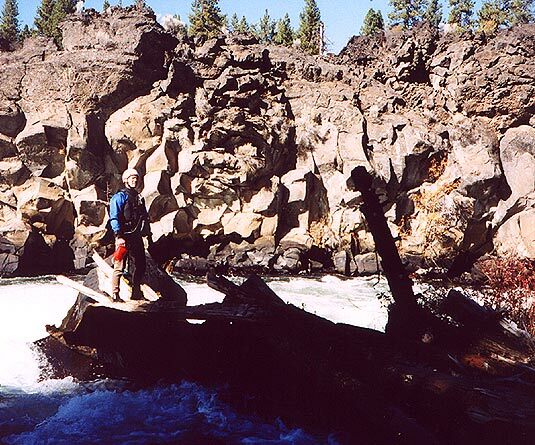 The whitewater rapidly tapers off below this log, ending abruptly in slack water at the Meadow Camp take out.